Buying organic feminine products is something I would never recommend compromising on, as regular tampons and pads contain nasty toxins like BPA, chlorine, pesticides, fragrances and other chemicals. 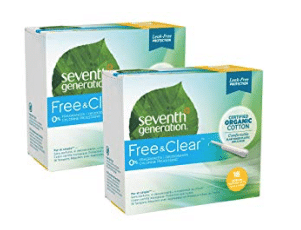 Amazon has a bunch of 30% off Seventh Generation coupons for their organic and chlorine free feminine care products! Just click each link below to clip. The discount will appear at checkout.